It’s been awhile, blog. But I’m back to discuss something of utmost importance: skating fashions. The second half of the season is about to kick off, and that tends to be the time of year where skaters switch up their look, or get an awesome new costume just before nationals. 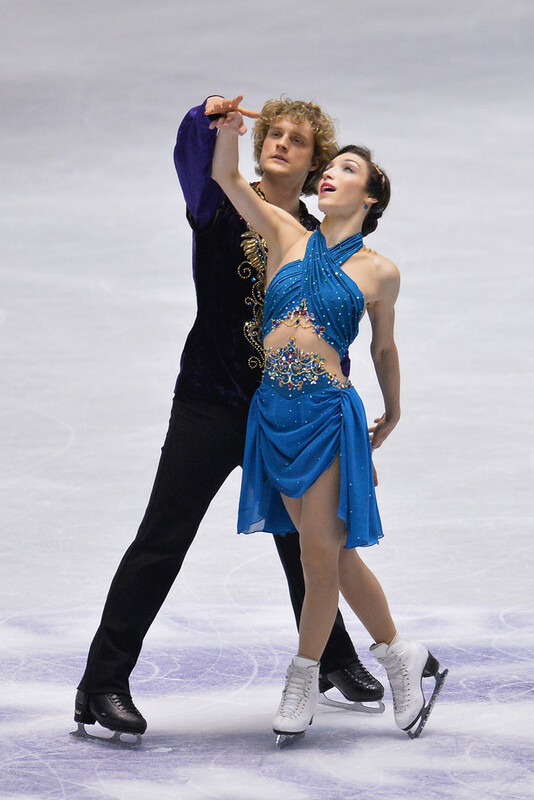 Sometimes I think it’s a great idea (see: Sasha Cohen’s gorgeous maroon Olympic free skate dress, compared to the gold she wore earlier in the season), but sometimes I mourn the departure of their first costume (RIP Meryl Davis’s stunning deep blue 2014 free dance dress, swapped for a lilac version for Nationals and the Olympics). The gray ombre in this dress looks fantastic with Ashley’s coloring, and fantastic on the ice. I love how the dress is almost an extension of her and of her movements; it is fitted perfectly and the understated skirt flutters ever so slightly. The simple silhouette is a good contrast to the mega-sparkle factor. Her program, set to “Exogenisis: Symphony Part 3” by Muse, is about coming out on the other side of a dark, difficult emotional experience and the gray evokes that mood. Her music has a river/winter theme, and the intricate beadwork on this dress looks like a river flowing, or even melting snow. I love the color, and appreciate that she didn’t go with a more straightforward blue. This one really pops on the ice. It looks like a river you might find in a watercolor painting, as opposed to in nature. But please, lose the gloves. My hatred of gloves is well-documented here and here. I haven’t always been the biggest Elena fan, in terms of both skating style and costume choice, but this dusty pink number was a game-changer. I love the unique semi-straight skirt, and the subtle gray accents. It’s a nice, more modern touch that the beadwork extends onto the mesh top portion of the dress, and gives the dress more of a runway-fashion look. Plus, the swept-up bun is the perfect hair choice with this dress, clean and elegant. I kind of love the short sleeves—they remind me of a dress I had back in the day, and, based on some Googling, are a more modern take on the typical look for the lead in “La Boheme,” her long program music. Fingers crossed none of these ladies make a mid-season costume change…but if they do, you’ll probably be hearing about it here on Twizzle Talk. Next up: ice dance! Categories: 2016-17 Season, skating fashion | Tags: Ashley Wagner, Elena Radionova, Evgenia Medvedeva, figure skating, figure skating fashion, Kaetlyn Osmond, skating fashion | Permalink. When I initially looked at the list of entrants for Cup of China, I wasn’t sure it would be a very exciting event. The winners in each discipline seemed like they would almost be a given, but some unexpected performances made this event fun to watch. Mao Asada won the event, as expected, as her comeback trail continues. Her short was fabulous and the triple axel in her long program was a thing of beauty. But the rest of her long program was shaky—I’m not sure we can say “She’s back!” quite yet. She still needs to shake off some rust. Elena Radionova seems to have regressed since last year. I didn’t love her presentation then, but now she seems to be confusing musical interpretation with overdoing it on the arm and upper body movements. There has been lots of online chatter hating on her long program musical selection of “Titanic,” but the music bothered me far less than the arm flailing did. Though the awkwardness of the “I’ll never let go, Jack” voiceover at the very end of the program cannot be denied. 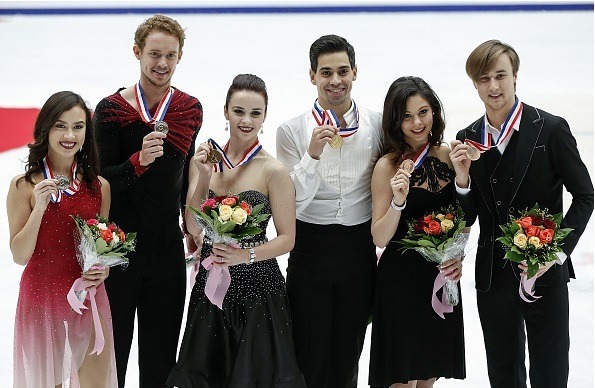 Many previews that I read thought Americans Madison Chock and Evan Bates would easily walk away with the gold medal, but Italian 2014 World Champions Anna Cappellini and Luca Lanotte seem to be returning to form and stole the top spot. Chock and Bates have beautiful flow and creative lifts. However, the move where he spins her around while she drags her feet (not blades) across the ice is really overused in both of their programs. They started using it last season and now, after seeing it in two more programs (in multiple places in the program), it seems almost lazy to keep reusing it. Especially when they are always so inventive in the lifts. Is anyone else over the foot dragging? The Italians really seem to be back in action, despite the fact that people wrote them off last year. I really liked these two in Sochi and when they won their world title that year, but last year was really rough for them. They were 4th at Worlds rather than defending their title. The light and joyful programs that they are using this year suit them so well, much more than their moody “Danse Macabre” free dance from last year. Anna and Luca won by almost four points here, and I felt that their twizzles were better than Chock and Bates’ twizzles. Things definitely just got a little more interesting in ice dance this year. At the halfway point of the Grand Prix (already?! ), all I can say about the pairs is that it is going to be crowded at the top when the World Championships roll around. The Russian team of Yuko Kavaguti and Alexander Smirnov took the top spot at Cup of China, ahead of Skate America champions Wenjing Sui and Cong Han. And there are THREE other Russian teams in the mix internationally this year, including the 2014 Olympic champions Tatiana Volosozhar and Maxim Trankov. Not to mention the defending world champions Meagan Duhamel and Eric Radford, and the fact that the American team of Alexa Scimeca and Chris Knierim are looking really strong this season. And the Grand Prix rolls on with Trophee Eric Bombard this weekend! I hope we’ll have Johnny and Tara back in the broadcast booth for NBC. Terry Gannon and Tracy Wilson called Cup of China, and I was glad to hear them finally acknowledge that Tracy coaches many of the top men on the circuit (Javier, at this event, but also Yuzuru Hanyu). It killed me when Terry would ask her hypothetical questions about a skater’s approach and training and she would answer without acknowledging that she was part of the coaching team. Anybody else? Am I too much of a stickler? Share your thoughts in the comments! Categories: 2015-16 Grand Prix, 2015-16 season, Grand Prix, impressions | Tags: Cappellini and Lanotte, Cup of China, Cup of China 2015, Elena Radionova, Grand Prix of Figure Skating, Grand Prix Series, Javier Fernandez, Madison Chock and Evan Bates, Mao Asada, Rika Hongo | Permalink.